The new tax law, commonly called the "Tax Cuts and Jobs Act," is the biggest federal tax law change in over 30 years. The following information summarizes a small portion of this recently enacted legislation. It is important to recognize that every individual and business are under different circumstances and thus will be affected in different ways. Therefore, it is vital to consult with your certified public accountant to ensure that you are taking every opportunity to maximize the benefits while mitigating the pitfalls. *Except where noted, changes are effective for tax years beginning after December 31, 2017. Any suspended provisions are effective through 2025. Below are some significant changes affecting individual income taxpayers. Effective for 2019, the shared responsibility tax under the Affordable Care Act for not having minimum essential health insurance coverage has been eliminated. The threshold for deducting medical expenses has been lowered, back to 7.5% of AGI for all taxpayers for 2017 and 2018. The Child Tax Credit increased to $2,000 per qualifying child and the phase-out threshold has increased to $400,000 in AGI. There is a new Family Tax Credit of up to $500 for dependents who are not a qualifying child for purposes of the Child Tax Credit. The estate and gift tax exemption amount doubled to $10 million, before any adjustment for inflation. Miscellaneous itemized deductions subject to the 2% floor are no longer allowed. Examples include investment expenses, unreimbursed employee business expenses, and tax preparation fees. Personal casualty loss and theft deductions are eliminated, unless the loss is incurred in a federally declared disaster area. The moving expense deduction and income exclusion is allowed only to members of the Armed Forces (or their spouses or dependents). Effective January 1, 2019, for new settlement cases, alimony is no longer deductible by the payer nor includible in income by the recipient. The home mortgage interest deduction debt limit is reduced to $750,000 MFJ ($375,000 MFS/S) on new mortgages closed after December 15, 2017. This is for combined primary and second residence. 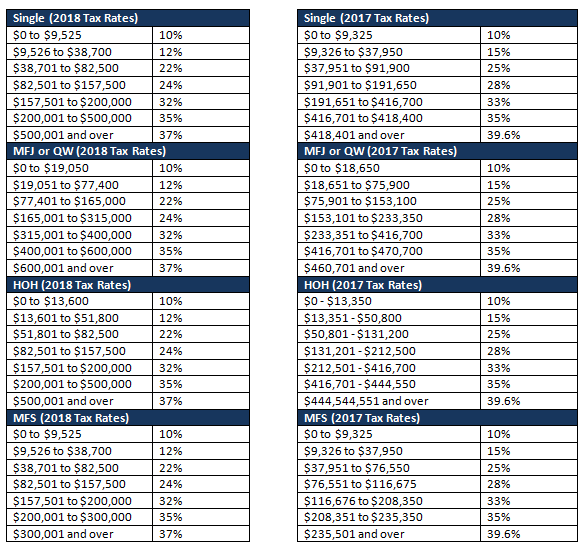 The following charts compare prior tax rates, brackets, phase outs and deductions with newly enacted legislation beginning in 2018. The parent's rate is no longer used to calculate the kiddie tax. Instead, taxable income attributable to net unearned income is taxed at the estates and trusts tax rates for both ordinary income and net capital gains. The Tax Cuts and Jobs Act has opened the door for all new planning opportunities that when proactively administered, can save small business owners a substantial amount of personal income tax. The following is just a broad overview of some of the recent changes. The two-year carryback provision for net operating losses (NOLs) have been eliminated on loses after 2017, and can be carried forward indefinitely, but with limitations. An individual taxpayer generally may deduct 20% of qualified business income from a partnership, S corporation, or sole proprietorship. In the case of a partnership or S corporation, the deduction applies at the partner or shareholder level. The deduction is disallowed for specified service trades or businesses when taxable income exceeds the threshold amount and is subject to other caps and limitation. 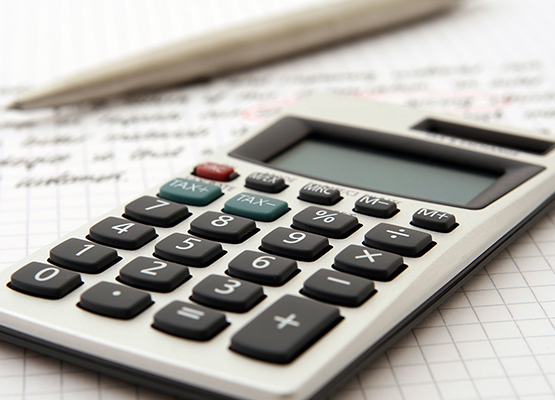 Careful planning can be done in this area to maximize income tax savings. The Section 179 deduction is increased to $1,000,000 and the phase-out threshold amount increased to $2,500,000.